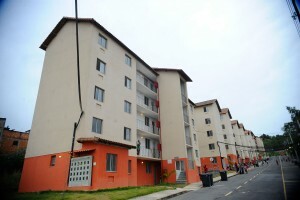 SÃO PAULO, BRAZIL – With the third phase of the government’s Minha Casa, Minha Vida (My House, My Life) housing project scheduled to be launched on Thursday, September 10th, government officials are signaling that this major social project may be on the list of those whose investments will be reduced due to the expected budget deficit for 2016. The Minha Casa, Minha Vida was one of the projects Rousseff relied on to get re-elected in 2014. Government housing program, Minha Casa Minha Vida provides houses such as these in the state of Rio de Janeiro for low income families, photo by Tomaz Silva, Agencia Brasil. Last week, government officials presented Congress with the 2016 budget proposal that forecast a primary deficit of R$ 30 billion for the country next year. Analysts say that for the government to significantly reduce the deficit, the Administration will have to cut spending, which would include some social programs. President Rousseff also admitted that the program’s rhythm from now is likely to slow down significantly. “It will be very difficult to construct the three million houses (promised) but we will try our hardest to do so,” she told supporters during a trip to Campina Grande, Paraiba to inaugurate almost two thousand units of the project. The Minha Casa, Minha Vida program, is a massive public low-income housing project funded primarily through the PAC 2 (Growth Acceleration Program) launched in 2009. It calls for at least one third of units to be given to families making up to three minimum wage salaries. From 2009 to 2014 data from the federal government shows that roughly two million housing units had been constructed nationwide, with an additional 350,000 units planned for the first semester of 2015.